Here is a very beautiful handmade tile. 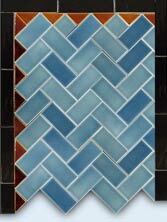 The image is a reproduction of a tile originally produced by the JG Low Art Tile Co. of Chelsea., MA., circa 1883. I've been told it is based on a German fairy tale - but I can't find the reference myself. 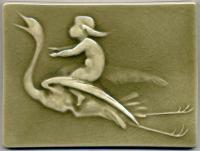 Wherever the inspiration came from, everyone can relate - A baby sitting gingerly on the back of a stork - perhaps being flown to it's "new home"? The tile measures 6 7/8" long x 5" high, and is glazed in a rich fern green crackle glaze. This tile deserves to be hung in a place of honour! Print out the name of a newly arrived baby on a transparent label, and this makes a one-of-a-kind baby gift! This tile is available in all glaze options, but details are best highlighted in the WA gloss series.